Blogging from A to Z Challenge? I’m in! Back in February I read a post by my friend Corinne Rodrigues of Everyday Gyaan which was all about the upcoming Blogging From A To Z Challenge. I’m always up for a challenge – especially a blogging challenge! – so I was immediately intrigued and decided to learn more. 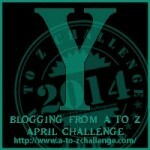 Basically, the idea of the now-annual event is for participants to blog their way through the alphabet in April, posting on a topic beginning with the letter A on April 1, B on April 2, and so on, all the way through the month (with the exception of Sundays) until finally arriving at the letter Z on April 30. (You can find some background and a more detailed explanation of the challenge here.) Posts may be based on a theme, or not – the only guideline is that they must follow the prescribed letter of the day. It’s a fun way to add some structure to your blog posts and connect with other bloggers who are doing the same. I remembered seeing posts from others who participated in this challenge in previous years, but had never signed up and committed to doing it myself. That is, until this year! Since I’m attempting another 365 consecutive days of blogging in 2014, and am (so far) off to a perfect start, I thought I’d piggyback on what I’m already doing and jump in on the Blogging From A To Z Challenge for April. I signed up for the challenge, joined an AtoZ 2014 Facebook Group, started brainstorming about a theme, and finally joined an A to Z Challenge Theme Reveal BlogFest… which brings me to today. When I was debating possible themes, I knew I wanted something different, lighter, a little more fun and a little less “thinky” than the sort of thing I often write. I wanted my April posts to be focused on creativity and growth. After a long, grey winter, I wanted something cheerful and fresh and visually appealing. Confused?! Don’t be! Read all about my love of tangling in this post (don’t worry, I’ll wait for you! 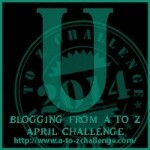 ), then come back and see how I’m going to tackle the Blogging From A To Z Challenge. Back now? OK, here’s what I’ll be doing. learn three new tangles, each with a name that begins with the appropriate letter for the day. create a 3.5″ square Zentangle®1 tile which incorporates the three tangles I just learned. share photos of my process and links to instructions (in case you’re interested in doing some tangling yourself!). Some challenge days my posts might just be captioned photos, but I’m not ruling out the possibility of including some wordy rambles, depending on the mood of the moment. We’ll just have to see what transpires! So I’m looking forward to a creative, energized, growth-filled April, with a blog that’s awash in pretty images and inspiration. And I invite you to come along for the ride! Now this looks like an interesting challenge. I will have to do some brainstorming for a theme myself. 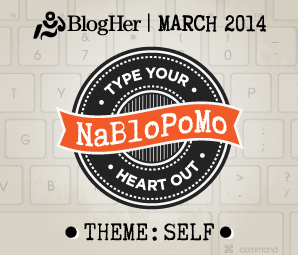 This is my first time learning about this blogging challenge. Katrina recently posted… Blog Help: Are You Using Fiverr for Your Blog Needs? You’re welcome – if you decide to join in, I hope you enjoy it! Laurel Regan recently posted… How well do you know yourself? LOL, I can imagine! Some of the letters are definitely a challenge. Thank you – I’m looking forward to the challenge! Kathy does beautiful work – she’s an inspiration! Tangling fascinates me: why people do it, how they find time, what they do with the tangles. Looking forward! It’s a very relaxing and satisfying form of art – and really, it can take as much or as little time as you have to spend! I’m looking forward to picking it up again. Laurel, love your theme. I am fascinated with zentangles and I am looking forward to your art! Yes, I am going to post on Sundays too – and I think I’ll start tuning those posts towards gratitude! Let’s rock! Hugs! Thank you so much, Vidya! Looking forward to April! Now I’m really in trouble. You MADE me read your very enticing tangling post, and I’m not an artist but have wanted to tiptoe into it along with my new blogging venture. So tangling is on my “look into” list for May, and your blog is on my April reading list. Very excited!! Wonderful! Tangling is so satisfying, whether or not you consider yourself an artist. I hope you do give it a try! You make it all seem so effortless, Laurel! I’m always in awe of you. Looking forward to seeing all the tangles! Kathy does some beautiful work! She’s definitely an inspiration. I like this tangling theme!! All the best ..looking forward to it! 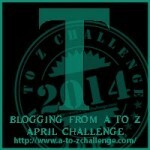 nabanita recently posted… A to Z Challenge Theme Reveal – A Tales Buffet! Thank you! I think it’ll be a lot of fun! 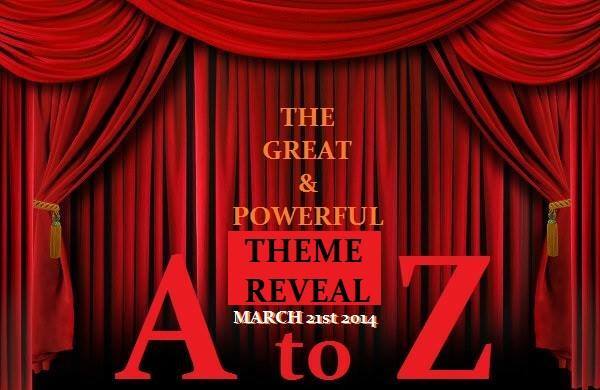 Ananya Kiran recently posted… Theme Revelation ! I am fascinated! I have never heard of tangling and I am really looking forward to learning more. Good luck with the challenge! This is my third year and as usual I am still not organized but I’m hoping to write a few posts today. Thank you so much – I think it’ll be a lot of fun! I do love the idea of a blogging challenge. However, I’m working on my novel, Azure at the moment & I would like to focus on that! Hello Lauren! My name is Krystol and I too will be doing the challenge this year. This is my first time and I must say that I’m very excited and nervous. I guess figuring out what to say on a daily basis using the letters of alphabet. Tangling, huh? I had never heard of this prior to reading your messages. But, it looks fun. It’s a pleasure meeting you and feel free to check out my reveal at http://www.writingsbykrystol.com. Very nice to meet you, Krystol – all the best on A to Z! I think it’ll be a lot of fun. Laurel, I have not heard of tangling before. I’ll be interested to see what you come up with each day. I’m doing the challenge, too. I didn’t participate in the reveal but am hoping to keep up with the daily posts. Every day I think I will get a running start and write my posts in advance, but so far it hasn’t happened! That’s some very cool artwork! I’ll be looking forward to your posts. It’s my first time participating as well. 🙂 Good luck! 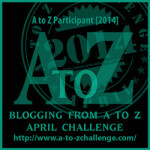 This A to Z challenge sure sound fun, can’t wait until it start. Good way of meeting new bloggers. I’m going to wing it or (MI) person. I’m working on setting up the framework for my posts now… it’s a lot of work, but it’ll save time later! So glad to hear you’re doing this, Laurel, and what an interesting topic. Your tangles are beautiful, and I’ll be looking forward to see what you do. I’ve done the challenge for the past two years but I’m passing on it this year–I couldn’t come up with a theme that interested me enough. I’m happy to read other people’s, though! Thanks so much, Elaine! It’ll be a change from just writing, but I think I need to focus on something more visual for awhile. Looking forward to it! Awesome I love tangling. Look forward to some very zen tangles. Yay. You are the first blog I looked at for the theme reveal as I just returned from being on the road this week. WOW – how intriguing — I look forward, as usual, to your posts during this challenge. Very nice to meet you – and so glad you stopped by and commented! All the very best on the challenge – it’s going to be fun! 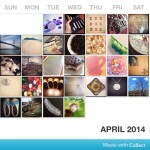 karen recently posted… Groovebook: A Groovy Little iPhone App! Oh wow! That’s an incredible project and a very unique theme! Good luck Laurel and looking forward to following your journey. Very interesting and I believe A-Z comes at a good time for you in the resolution to carry on blogging 365 days! These challenges definitely help keep me going! oh wow! amazing tangles. Waiting for them. Now this is a cool idea!! I will look forward to seeing your tangles and following your progress through the month. Awesome! I can not wait. I am planning to share some finished tangles throughout the month mixed in with 55 fiction and haiku. Thanks, Kathy! I am so looking forward to April! that is so intriguing.all the best. Previous post: How well do you know yourself?